How do I Choose the Best Cardio Circuit Training Exercises? Jogging can be part of a cardio circuit training routine. 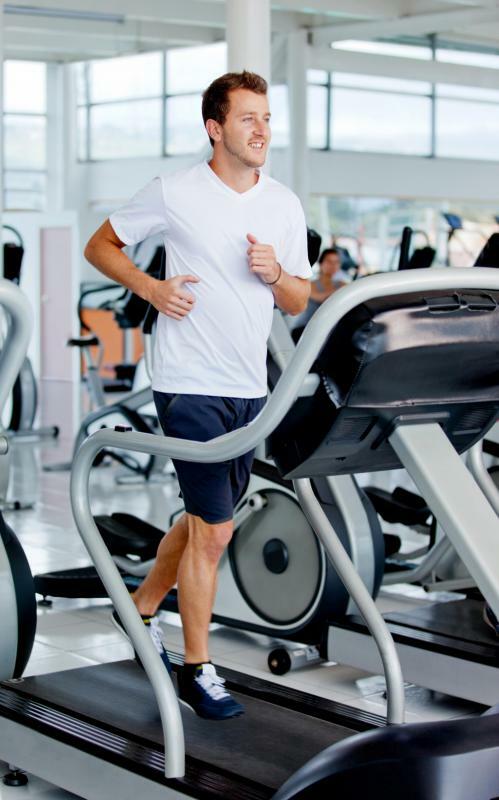 Running on a treadmill may be included in cardio circuit training exercises. Choosing the best cardio circuit training exercises is largely about maximizing the benefit you get from a particular workout. Although cardiovascular exercise is primarily used for increasing the body’s overall fitness and endurance it can also build specific muscles. For this reason when choosing cardio circuit training exercises you should think about which parts of the body you most want to train. Cardiovascular circuit training exercises should also be varied in order to avoid boredom, which can decrease motivation, and overuse injuries. One of the major benefits of using a circuit training exercise program is that it provides more variety. Circuit training involves using a number of different exercises, machines and techniques in a training session rather than sticking to one or two. This allows you to work out a number of different muscles while getting fit. Another advantage is that you will be using a number of different muscles, which makes it possible to exercise for a longer period of time. Some of the cardio circuit training exercises you could use in a session include rowing, jogging, skipping and cross training. Although swimming is an efficient cardio exercise it is difficult to incorporate into a circuit training routine. The exercises you choose for your routine should be as enjoyable as possible while still providing a tough workout. A potential downside to cardio circuit training is that it requires more discipline than regular exercise. Breaks between exercises should be short, otherwise this can negate some of the benefits. It’s important to plan the breaks between exercises beforehand in the same way that you plan the duration of exercise. An example cardio circuit training workout session could include a 10-minute run on the treadmill, five minutes using a skipping rope, 10 minutes on the elliptical cross trainer and finally back to the treadmill for a warm down. All of these exercises will help to warm up the muscles as well as increase the heart rate. It’s important to remember that the more you perform a particular circuit routine the more your body will become used to it. If a particular exercise is becoming easy then swap it for another or increase the resistance. Although weight training can be included in cardio circuit training it isn’t considered to be cardiovascular exercise. A rounded exercise program should include weight training, however, to provide variety as well as strengthen the muscles. Compound muscle building exercises such as squats and bench presses are two examples. How Do I Choose the Best Yoga Ropes? What are the Different Types of Cross-Training Exercises? How do I Choose the Best Cross-Training Workout? How do I Choose the Best Cardio Strength Training Exercises? You can easily build some strength training into your cardio workout program by choosing certain machines. For instance, some elliptical trainer have handlebars that have to be pulled, working your chest and back muscles. Others have an adjustable incline, allowing you to work all the muscles of the leg from the calves to the quads. Rowing is a cardiovascular exercise that is also a whole-body workout - legs, upper body, and core - if done correctly. A lot of people row with bad technique, meaning they don't get the benefits and could even injure themselves, so you might want to ask an instructor at your gym to show you. little hard to describe, but the skating movement really works your inside and outside thighs while you get your cardio in. I like to get a lot of bang for my buck when I exercise, so I always look for ways to kill two birds with one stone.